Moving on, Canon also has announced three compact cameras. 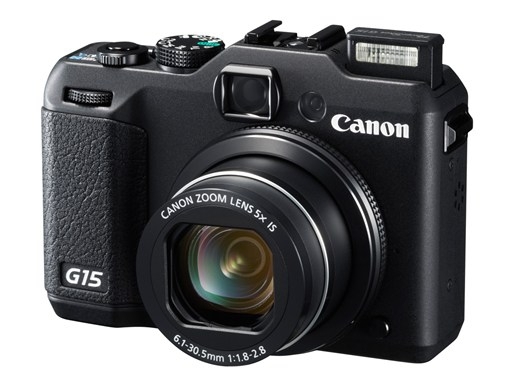 Let's start with the Canon Powershot G15. It is the successor to the G12, and the main upgrades come in the form of a new 12 megapixel sensor, and a much faster optically stabilised 4x 28-140mm equivalent f/1.8-2.8 lens. The camera also gains a faster AF system and a 3" VGA LCD. 1080p video at 24fps is available, and the camera is also smaller now. That, however, does not come without a price: The G15 no longer features an articulating arm for the LCD, and also loses the dedicated ISO dial. The camera will ship in October for US$500. Up next, is a modest update to the S100, the Powershot S110. The new model gains WiFi, a touchscreen, and supposedly has a tweaked 12 megapixel sensor. The lens is still the optically stabilised 5x 24-120mm equivalent f/2.0-5.9 lens, and the ring control is still present. In keeping with the "What Canon Giveth, Canon Taketh Away" theme this Photokina, the S110 loses the built-in GPS that the S100 had. Ships in October for US$450. Finally, there is the SX40 HS update, the crazy Powershot SX50 HS. Crazy because it features a 50x zoom lens. That's right. The optically stabilised 24-1200mm f/3.4-6.5 lens is the camera's main talking point. Is there anything else to talk about? Same 12 megapixel sensor, and well... 50x zoom lens. Ships in October for US$480. More photos and details at the links below.